After crunching a lot of statistics, Bloomberg News concludes that the BDS movement is failing to have any impact on the Israeli economy. 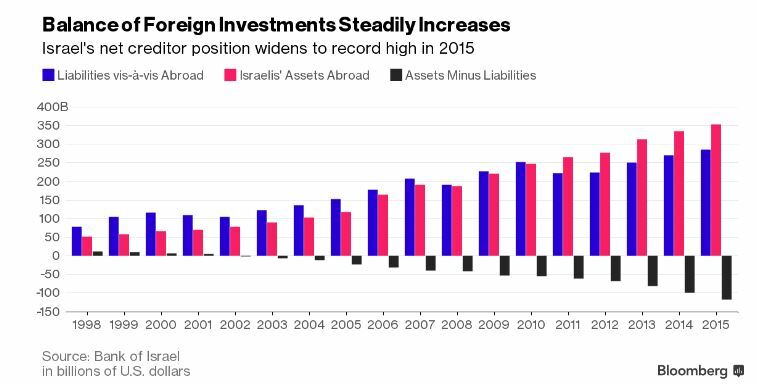 Foreign investments in Israeli assets hit a record high last year of $285.12 billion, a near-tripling from 2005 when the so-called Boycott, Divestment and Sanctions (BDS) movement was started by a group of Palestinians . . .
Money managers, economists and government officials say Israeli assets are an attractive alternative to weak performers elsewhere. The country’s economy is slowing but growing faster than those of the U.S. and Europe and its interest rate is higher. Plus, many reject the notions driving the boycott — that investing in Israeli innovation and natural gas violates Palestinian rights, and that Israel’s misdeeds are so exceptional that they justify singling it out for censure. he Austrian financial giant Bawag closed the bank account of the pro-BDS Austrian-Arab cultural center (OKAZ), which hosted a Palestinian terrorist in Vienna in April. Paypal, a global leader in online payment services, has cut off payments to the anti-Israel group BDS France. Later in the day, the link to Paypal was removed entirely from the group’s webpage. Earlier in the month, the site’s connection to Paypal remained fully operational. German Chief of Staff Volker Vicker, who visited the country a few weeks ago , chose the Heron ” UAV Israel over American competitors – “Predator” and “Raptor ” – through which the US carries out assassinations from the air by the CIA and the Pentagon . A history professor and anti-BDS warrior at McGill University in Canada responded enthusiastically to a landmark decision taken on Wednesday by the legal arm of the institution’s student body to ban anti-Israel boycott, divestment and sanctions activities on campus. The decision came in the wake of three BDS motions over the past year and a half, which were put to a student vote at McGill and defeated. JNS.org – In a blow to the Boycott, Divestment and Sanctions (BDS) movement in Spain, a Spanish court has invalidated a municipal boycott of Israel on the grounds that the move is discriminatory, anti-Semitic, and incites hate crimes. “Over the last year and a half there was a tectonic movement in Spain as the far left gained access to public institutions and local government,” said Angel Mas, chairman of ACOM, a pro-Israel organization that combats BDS in Spain and sued the Langreo City Council over the declaration, the Jerusalem Post reported. “For the first time in a court decision, the court said that the BDS declaration in the city was discriminatory, anti-Semitic, broke human rights, and needed to be cancelled,” Mas said. (JTA) — Following legal action by supporters of Israel, four Spanish municipalities dropped their former policy of support for boycotts of the Jewish state. Occurring amid an unprecedented judicial crackdown in Spain against the phenomenon, three of the four reversals last month came following court-issued injunctions that suspended municipal motions passed in support of a boycott, ACOM, a Madrid-based pro-Israel group, wrote in a statement last week. The fourth municipality, Sant Sadurnì d’Anoià, a town of 12,000 residents in Catalonia, voided its own motion in support of the Boycott, Divestment and Sanctions, or BDS, movement following ACOM’s threat to sue. Two of the rulings came on May 31, when the 3rd and 4th Administrative Courts of Barcelona nullified the BDS policies of the Catalan cities of Sant Adria de Besòs and Sant Quirze del Vallès, respectively, which have a combined population of approximately 55,000. Earlier last month, an administrative court in Oviedo ruled that a motion in support of the BDS movement passed in January by the City Council of Langreo in Spain’s north was discriminatory and must be scrapped. Israel Antiquities Authority says millennia-old sarcophagus covers were shipped out of Egypt and eventually discovered in a shop in Jerusalem’s Old City • Return was put on hold after Egypt recalled its ambassador in 2012 due to fighting in Gaza. Israel has returned two looted ancient Egyptian sarcophagus covers to Egypt amid warming relations between the countries. The Foreign Ministry returned the relics to Egypt’s ambassador to Israel at a ceremony on Sunday. The ministry said their return was possible due to its “strengthening dialogue” with Egypt’s Embassy in Israel. The Israel Antiquities Authority says the colorful sarcophagus covers date back as early as the 16th and 10th centuries BCE. It says they were shipped from Egypt to Dubai and later from London to Israel. IAA inspectors discovered them in 2012 in an antiquities dealer’s store in Jerusalem’s Old City. The New Jersey Legislature passed legislation that prohibits the state from investing pension and annuity funds in companies that boycott Israel or Israeli businesses. The bipartisan bill in response to the Boycott, Divestment and Sanctions, or BDS, movement against Israel passed the state’s General Assembly on Monday by a vote of 69-3 with 2 abstentions. It unanimously passed the state Senate in May. Gov. Chris Christie is expected to sign the bill into law. The state’s $71 billion pension fund provides coverage for about 800,000 current and retired public employees. A state Treasury Department spokesman told the Philadelphia Inquirer that he was not aware of any companies that the pension fund is invested in that would violate the legislation. Gov. Andrew M. Cuomo of New York ordered agencies under his control on Sunday to divest themselves of companies and organizations aligned with a Palestinian backed boycott movement against Israel. Members of the American Anthropological Association have narrowly voted to reject a resolution calling on the group to boycott Israeli academic institutions. A total of 2,423 AAA members voted to oppose the boycott measure, while 2,384 supported it. About 51 percent of AAA’s 9,359 voting-eligible members participated in the boycott vote, which took place online from April 15 through May 31. The results of the online vote contrast sharply with the results of a vote in favor of an academic boycott that took place at the association’s annual business meeting in November. At that time, members in attendance voted by an overwhelming 1,040 to 136 margin to move forward with a boycott resolution by placing it on an online ballot for consideration by the full membership this spring. The general sentiment among attendees at the annual business meeting was strongly pro-boycott, while the results of the online vote suggest a fairly even division of opinion among AAA members. The world-renowned Israeli Biomed Conference hosts representatives of leading companies, senior lecturers and hundreds of guests involved in the life sciences from Israel and around the world every year. The events of Israel Biomed Week enable Israeli companies to create business ties and opportunities and to maximize exposure for their most innovative products and developments. As part of the effort to showcase Israeli companies to the Chinese market, a number of important delegations from China arrived this week to the conference as guests of the Israel Innovation Authority. Unique among these is a delegation of investment bodies (both private and funds) with diverse fields of interest including life sciences, IT and cleantech. In addition, some 20 Chinese companies in the fields of medical equipment, pharmaceuticals and agricultural technology from the provinces of Sichuan, Shandong and Zhejiang sent representatives to the conference. The arrival of these delegations is a result of the close cooperation between the Israel Innovation Authority, Chinese provincial governments and the federal Ministry of Science and Technology of the People’s Republic of the China. According to its inventors, CEO Chen Nachum and his father, Dr. Zvi Nachum, the Livia device provides instant relief from cramps, and lasts up to 15 hours on a single charge, long after anti-pain pills have worn off. The delegation was jointly organized through the US Jewish Federation and Israeli and groups. One of the goals of the trip was to help improve the dialogue between the US and Israel – primarily amongst liberal groups, which have a tendency to be more critical of Israel. I’m glad we all agree that BDS is failing. And these halfwit losers think that labeling/boycotting Israeli avocados will destroy the Israeli economy. The only things that these palestinians terrorists are good at are making Bombs ans Babies…..
I’ve said before that Omar Barghouti, as much of a gross opportunist pig of a failed Israeli-university student as he is, did the anti-BDS world a huge favor by making it plain that the endgame of BDS was to replace the State of Israel with a 23rd Muslim-majority (ideally from their POV, ALL-Muslim) state of Palestine. Some BDSers have tried to lie their way out of this (or pointedly downsized their BDS ambitions to apply to so-called occupied territories, like Peter Beinart) but when your front man and PR guru is who and what Omar is, it’s impossible to dodge the essential ugliness of BDS. One thing about BDS that I alternately find amusing and anger-causing, BTW, is the fact that whenever BDS is ignored it’s because the movement is so strong and correct and destined to win that it cannot be countered, and whenever BDS is addressed and dealt with it’s because the movement is so strong and correct and destined to win that its opponents are desperate to stave off a defeat that cannot be countered. The idea that BDS cannot be countered, that it’s unassailable, is IDIOTIC. Of course a house built on sand can be confronted, and that’s what the majority anti-BDS community has done and will keep doing; it’s just not necessary to respond to every stupidity and tirade from BDS, because they don’t deserve to have every wild pitch swung at. Interesante blog . Aprendo algo con cada sito web todos los días. Siempre es estimulante poder leer el contenido de otros escritores. Me gustaría usar algo de tu blog en mi web, naturalmente dejare un enlace , si me lo permites. Gracias por compartir.